We have teamed up with some awesome blogs to giveaway a really great blender! Plus, please read our host’s story below about how the BLENDTEC giveaway came about. When I was on vacation in New York City last November 2012, my girlfirend and I were surfing TV channels and happened upon one that was talking about Vitamix and Blendtec. It explained how Vitamix had copied another company. If you want the details, you can read more about this federal court ruling here. I will now be affiliating with Blendtec. I was really excited about the cookbook that came with the Blendtec. It is spiral bound and hard sided and someone that is really into eating healthy has put down some fabulous recipes! The recipes are labeled as to whether they are Gluten-Free, Dairy-Free, Vegan, RAW and low sodium recipes as well as regular recipes that require wheat, meat and dairy. There are even recipes for exfoliating and skin care, plus recipes for your pet as well! The recipes also have nutritional and calorie counts. In addition there are recipes for making your own flour. You do NOT need a separate container to make flour like you do for the Vitamix. That is a huge plus in my book. And there are recipes for making your own nut milks. Speaking of nut milks…I decided to see how Blendtec compared with the Vitamix in making Almond Milk since I use alot of home-made almond milk. I was thrilled because the lid of the Blendtec is much easier to use than the lid on the VitaMix. Previously, I had to ask my husband to take the lid off the VitaMix because my arthritic hands could not unlock it. I was shocked at how powerful the Blendtec machine is in comparison. I do not soak the Almonds when I make Almond milk. I use them straight out of the bag. The Blendtec has pre-programmed cycles, so I pressed the cycle for the milk. This machine is fast and powerful! When the cycle ended and I poured the ingredients into the strainer I noticed the feel of the almond pulp was much finer than the other machine and the milk seemed to have more almond flavor. My next comparison was to blend a quick gluten-free bread. I couldn’t believe how quickly this machine whizzed this mix together. I pulsed the Blendtec a couple times, scraped down the sides once and hit pulse again and it was done! The bread turned out fabulously and my husband loved the texture and flavor. I have to mention, again, how easy the lid is to handle on these Blendtec containers. I also like the wider container size that has the same volume as the taller Vitamix container. The Blendtec WildSide container is easier for me to handle. The Blendtec also fits on the machine and under my cabinets where the other machine does not. The Twister container is used for tackling thicker dough and comes with a small recipe booklet. There are recipes items that require high speeds or have heavy doughs such as Dairy-Free Ice Creams, pasta dough, pizza dough, nut butters and many other recipes. To test the Twitster Container I made the recipe for Whole Wheat Spinach Pasta but substituted gluten-free flour and I didn’t have spinach, so I substituted cilantro. It was a very thick dough but I used the special spatula, Spectacula, as it is called, which made it very easy to remove the ingredients and very easy to clean the container. This dough was very easy to make with the Blendtec, and the noodles held up very well despite using gluten-free flour! My final thoughts on the Blendtec are that it is a more powerful machine than the Vitamix and you do not need a plunger to use with the Blendtec. I like the fact that I do not have to open the top of the lid to push down food when you use a Blendtec. It is very easy to use and I like the fact that Blendtec provides a separate container, the Twister Jar, to handle thicker projects. I also love the Blendtec lids. I can easily use them and remove them myself without any help. This fact makes it much easier for me to cook when I am at home alone. I also love the service that Blendtec has provided me in the short time I have known them. I am proud to be affiliated with Blendtec and I highly recommend them. 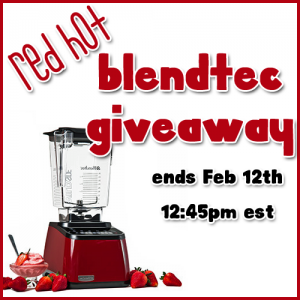 This giveaway of a BlendTec Blender and Jars is truly awesome! This blender is the terrific! I hope to win and gift it to my beautiful mom. Everyone needs this blender in their home. It will be used every single day in mine. It looks like an awesome blender! Way out of our price range for a blender so I’m keeping my fingers crossed! Thank you Blendtec for sponsoring this awesome giveaway! I would love to win this for my mother who is 75 and still active. I’ve heard such good things about Blendtec. Thank you for the chance! I have read wonderful reviews about this blender. A blender that can be used to make pasta… awesome! Thank you for the giveaway 🙂 I really need a blender to make diet meals and smoothies! I could really use a blender 🙂 hope I win! I’m veg but not gluten free— would love this! This blender looks great and I love that the recipes are labeled if they are gluten free.